Do You Need to Have a Healthy Diet? As you grow older, do you need to consider improving your diet? It is always good to have a healthy and well-balanced diet and if the food you are eating is not considered to be healthy, and then yes you will want to consider improving your diet. The kinds of food you are eating can actually affect your health a lot more than you would think, especially when you are already at an advanced age. Through in home private duty care in Southeast Michigan, we can help you not only improve your health but also your diet. 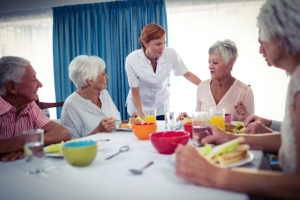 Heaven Sent Home Support Services LLC provides exceptional in-home elderly care assistance in Southeast Michigan that will help you improve your diet and life! If your diet consists of food that is not healthy such as greasy burgers on a daily basis, then you need to start looking for healthier alternatives. Many restaurants nowadays offer delicious and nutritious options for you and you can even try cooking up your own healthy meals as well. Although, if you feel like it is a bit of hassle to eat right, we can prepare healthy food for you so you do not even have to lift a finger. Having an unhealthy diet can actually cause many problems for your health such as heart attacks, strokes, blood clots, Alzheimer’s, Dementia, and much more. Obviously, these are conditions that you do not want to get under any circumstances and this is why it is such a critical thing for you to consider healthier alternatives when eating. It is no longer expensive or a hassle to eat right because we will make sure that you are getting the best food possible. If you want to continue doing the many things you love, you will need to maintain your health. The best way to maintain your health is through exercise and a healthy diet. When you feel the need for a burger, have a salad instead and it is really that simple. These lifestyle changes will help you live life to the fullest and it will keep you healthy for many years to come. Finding out more about how you can live a healthier life is as easy as checking out our website www.hshssllc.org for more information. You can also give us a call at 313-272-1222 or 248-262-7111. It is time to improve your diet for a happier and healthier life today. Ask for assistance from our friendly staff.